Getting the right tile size for a small bathroom, whether for walls or floors, will have a big impact on making your small space feel bigger and brighter. But from the thousands of different styles, colours and designs on the market, where to start when choosing the best bathroom tiles that suit and enhance your space? We’ve put together some tips to help you find the perfect tile size for floors and walls that suit your bathroom and enhance the sense of space. Oh and if you are starting your bathroom from scratch find out how to design a small bathroom like an expert, too. What's the best tile size for a small bathroom? Tile size shouldn’t be determined by bathroom size, despite what you may hear. A small bathroom can actually benefit from a large tile. With fewer grout lines the walls and floor are less cluttered and the room visually expanded. Using smaller tiles, such as mosaics, will give you lots of grout lines, which can give the bathroom walls a grid-like appearance that can promote the feeling of being boxed in – making your bathroom feel smaller still. This doesn’t mean you have to rule out small tiles out, however. If you've fallen for some beautiful mosaics, you can mix it up a bit by using different sized tiles in different zones of your bathroom, with smaller tiles being limited to the showering area, a larger format tile used in the majority of the room, and mosaic tiles in alcoves or recesses (spaces you don’t expect to feel generously-sized). It can be hard to tell what size tile will work in a small bathroom when you're looking at it on the shelf of a tile shop, so it makes sense to request samples (a few to lay on a sample board if you can) to see them in situ. Going to be tiling a bathroom wall yourself? Now would probably be the best time to mention we have an really easy to follow step-by-step guide to help you out. Does the tiles' layout make a difference? A clever trick to use in small bathrooms is to lay your tiles in diagonal patterns, which tricks the eye into seeing the space as bigger than it really is. When you take a look at normal squared options they are fairly easy to count, but arrange them diagonally and your eyes are drawn to the longest dimensions of the room. Popular chevron patterns can do this well. If a diagonal tile pattern doesn’t sound appealing, consider laying your tiles in brick bond. This is a popular choice for metro tiles, but helps limit the grid pattern effect mentioned earlier, which can emphasise the limited width and height of a room. We have loads more clever bathroom design tricks, so make sure you go and check those out too. Which colour tiles to choose for a small bathroom? It’s a well-known rule that using lighter colours will help a small room look bigger, so apply that to your picking the right tile size for a small bathroom, too. Choosing lighter colours, such as white or cream, for your bathroom tiles will help reflect more light than darker colours would. Another trick for getting the right tiles for a small bathroom is to use glossy, metallic or mother-of-pearl finish tiles, which will enhance the space by reflecting light, giving a sense of grander proportions. Inspired by the decorativve beauty of ancient materials and styles, Devon & Devon's Flora tiles in Blue Spring make a captivating focal point in the room. However, don’t shy away from dark colours – a darker tile can be used effectively to add a sense of depth to a space, either throughout the room or, on walls, as a pencil line around the width of the room, which will make it look longer and wider. Patterned or plain tiles for a small bathroom? Which to choose? Patterned tiles, especially busy ones, will inevitably make walls advance visually, which means they'll make a bathroom feel smaller. However, if you'd like to use patterned tiles to add character, put them below dado rail height, and use plain, light-coloured tiles above. Taking this approach will draw the eye upwards and across the room, making it feel larger and lighter. 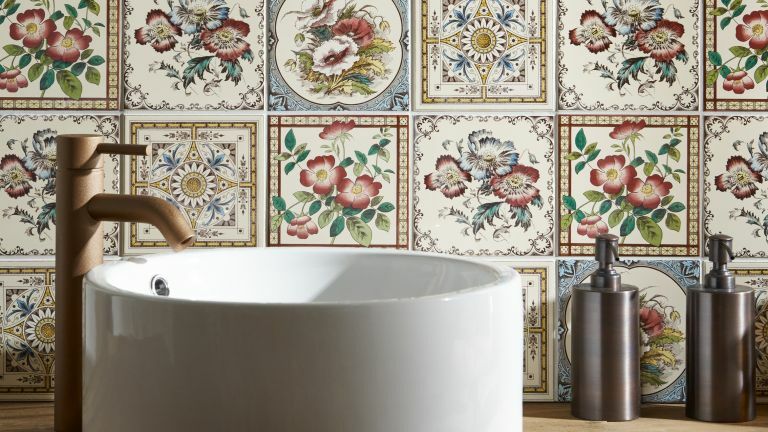 A small bathroom can feel unwelcoming and clinical if it's tiled from floor-to-ceiling and wall-to-wall but, to enhance the feeling of space in the room, you need to aim for as much decorative flow as possible. In other words, if the placement of the fixtures and fittings means that there will only be small gaps of painted wall between, say, a bath splashback and a basin one, it's better to tile across the length of the wall and to limit the changes in tiling levels than to interrupt the tiling. If you find you are tiling the majority of your walls, just make sure you choose a bathroom floor tile that doesn't look too matchy-matchy. A entirely white tiled bathroom? Weird vibes. Choose a patterned floor tile to add some contrast you wall tiles (or vice versa), we have loads of inspiring patterned floor tile ideas over in our gallery. Measure up and calculate the number of tiles you need before you head out to buy them. To make life easier for you, there are many tile calculators available online. You can also go to your local retailer armed with the measurements and they should be happy to help you out. Make sure to add on an extra 10 per cent to allow for breakages, cuttings, waste and pattern matching. You don’t want to be halfway through tiling your bathroom before you realise that you don’t have enough to finish the job. Metallic toned tiles help to reflect light back into the room, making it feel more spacious. Pairing the tiles with the white Beaumont lever basin from Victoria Plum and dark framed mirror also creates an art deco feel. Travertine, marble, limestone, slate and granite are all natural stone options for bathroom tiles, each with its own natural properties. Slate in particular is great for bathrooms, as it has low porosity and its riven texture is non-slip, while stones such as marble, travertine and limestone can be polished to a high shine for a stunning finish, but need to be sealed. If you need any more advice of choosing natural stone flooring then check out our guide. Ceramic and porcelain tiles are usually a more affordable manmade option, and there is huge scope in the range of finishes available. From those that mimic stone and even wood, to bright colours, decorative patterns, high glosses and raised prints. We have plenty more ideas and tips on choosing ceramic and porcelain tiles. Mosaics, in stone, glass or ceramic, look beautiful over smaller areas, such as behind the basin, and give a sense of having been meticulously laid. They are also available in sheets for easy installation.